If Justin Strube’s pickup truck could talk, it could tell you the quickest and smoothest route from West Texas to South Texas. For nearly two years, Strube has been traveling almost weekly from his home farm at Wall, near San Angelo, to La Pryor south of Uvalde, where he and a friend partner on a cotton farm. But that’s only part of his travel schedule. 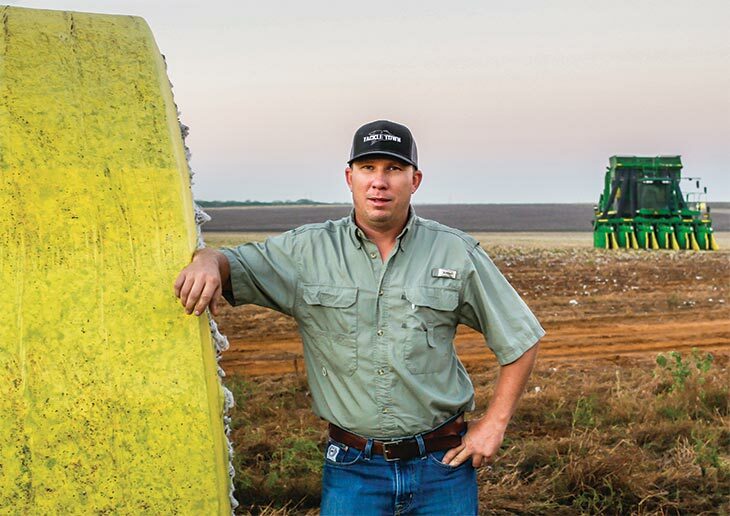 The ambitious young cotton producer also farms at Stiles on the edge of the Permian Basin, about 90 miles west of San Angelo, and does custom cotton harvesting throughout Texas. “My two farthest fields are 300 miles apart,” he says. For Strube, the long drives are worthwhile for the opportunity to expand his farming operation, extend his growing season by two months and generate additional income so he can eventually purchase land locally. The 33-year-old Strube began farming 14 years ago on rented land in his home community of Wall, while studying animal science at nearby Angelo State University. 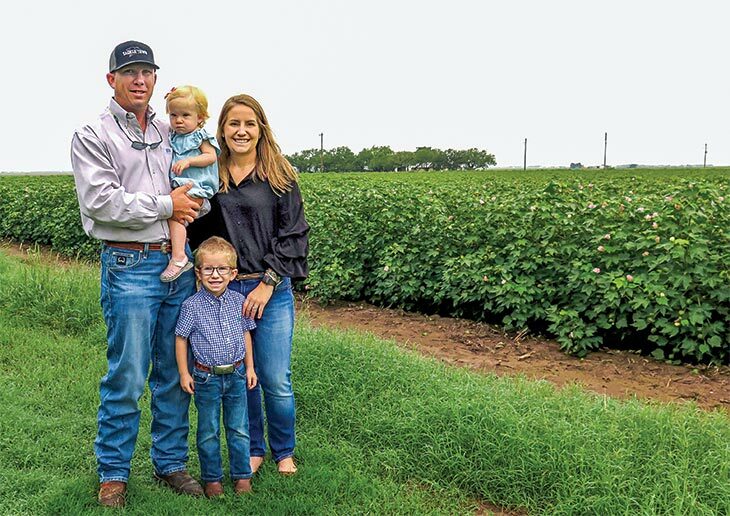 After graduation, he devoted himself to farming full time, planting more acreage as land became available in this fertile cotton-farming area east of San Angelo. Expanding in this area is difficult for a young farmer with limited capital. The area is prone to drought, irrigated land is not readily available, and water is a costly input. 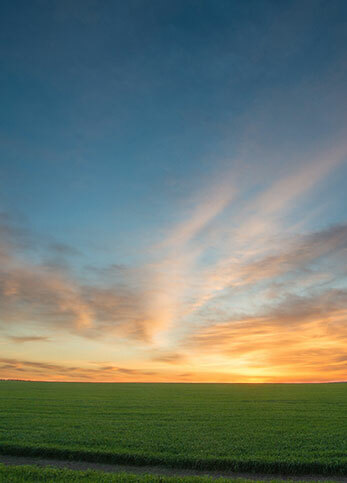 Moreover, suburban development is pushing farmland values up. “While the inputs are a lot greater, you have a much better chance of making a crop here with irrigation,” says Strube, who grows both dryland and irrigated cotton, rotated with wheat. A few years ago, he began leasing land in the Stiles area, just over an hour’s drive to the west, where planting time is a week earlier than at Wall. Then, two years ago, he and a college friend went into partnership on 1,400 acres of irrigated land near La Pryor in the Winter Garden area, a region known for its bountiful vegetable production. “We ran the numbers on it and thought we would take a gamble, and it’s paid off,” Strube reports. They also partnered on 800 acres at nearby Pearsall. The South Texas land requires different management practices than his West Texas farms. The soil is sandier and “moisture doesn’t go as far,” he reports. Root rot and white flies have been problems, too. On the other hand, the La Pryor farm will produce 3 to 4 bales of cotton per acre under good weather conditions, compared with about 2½ to 3 bales on the West Texas irrigated land. Last year, Strube and his partner invested in a John Deere 7760 cotton picker and a flatbed trailer to haul the enormous machine. Although he has done custom planting, spraying and harvesting for years, he pursued additional harvesting jobs throughout Texas this year and last to help pay for the new picker. “I feel it’s too big an investment not to be using it elsewhere,” he says. But “farming away,” as Strube calls it, comes with logistical challenges. His planters, sprayers, plows and trucks all have to be transported from one area to the other. Fortunately he can rely on help from his father, who owns a trucking company that hauls oilfield equipment. It was an equipment purchase that led Strube to membership in Central Texas Farm Credit. He had heard about the lending cooperative’s competitive interest rates and patronage payments from his cousin, so he contacted the lender when he needed to finance a new piece of equipment. Later, he returned to finance a 100-acre land purchase near Wall and a pivot irrigation system, and also refinanced the cotton picker. The relationship with Central Texas Farm Credit has been a good one for Strube, who appreciates receiving an annual patronage check from the cooperative. “It’s pretty nice, like a little bonus every year,” he says. He acknowledges that he couldn’t be on the road as much without the support of family members, particularly his wife, Allison, who also has a busy career as water utilities director for the City of San Angelo. “Luckily, Allison understands what it takes, and we have lots of family members nearby to help out,” he says. With two preschoolers, however, his goal is to concentrate his farming operations in his home community. In the opinion of his Central Texas Farm Credit loan officer, Jim Burkhead, Strube has the drive and ability to accomplish that goal. “Justin has been willing to do anything to succeed. He hauls equipment, sprays, harvests and plants for others, as well as farming his own land and leased land. And he’s done it all himself,” says Burkhead. “Justin is a testament to what hard work, dedication and a strong family support system can accomplish,” he says.